testing .... trying to edit/delete a post. These owlets are growing so fast!! TOOK THESE THIS AM ---CAN'T BELIEVE HOW BIG THE BABIES ARE!!! Little owlets aren't so little anymore!! Owlets are growing by the minute. Such pretty little ones. Is there enough Mrs. T to go around? Saw one lil T in the back and the other lil T in the front. Mrs. T and Toddler take an outing. "How do you like my tutu and fur jacket." Aren't they adorable! Their tutu's and tights are showing up and that way too cute head bobbing circle they do. Mom started leaving them alone a couple nights ago and must be joining Mr. T in hunting to feed them all. They are too cute and just going to get cuter and cuter now. One was even wingersizing tonight! Growing up way too fast. OKC owlet casting a pellet. After casting the biggest pellet I've ever seen, little one getting some shade with mom's feather umbrella. LOL! I think we have a video thanks to Emmie! Rodeo starts about the 2:00 mark. Darling Alessondra had a birthday over the weekend. She turned 8. She was surprised by a wonderful birthday card that viewers and chatters of Alessondra's OKC Great Horned Owl sight has generated. Attached is a link to the video of Alessondra thanking everyone for helping make her birthday more special. Every time I am watching these two goofballs it makes me think "where have I see that before?" LOL Pop. 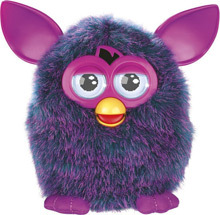 Never put the two together, but yes they do look like furby's. Here's a family portrait of moma & chillins.... dad couldn't fit in the pic.